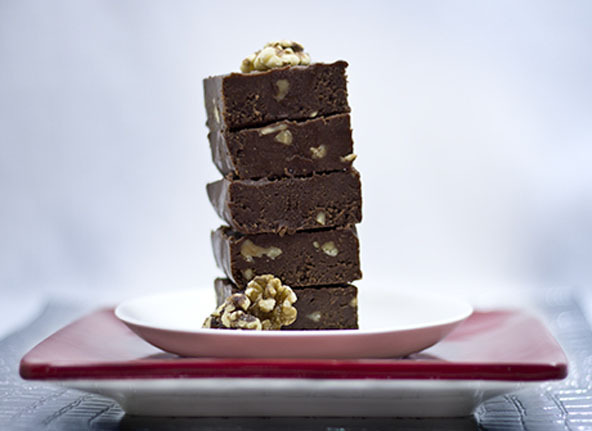 It’s the healthy coconut oils well known for brain health that earns this recipe the title of Brilliant Fudge. Who knew a non-dairy fudge could taste so close to the full dairy version? Again, It’s Brilliant! Clearly a “Yield-Special Occasion, AA” recipe but when you need it, it’s here for you and you won’t be disappointed! If using unsalted nut butter add a pinch or so up to ⅛ tsp sea salt. Use a small 4-6 cup size pot over the stove to melt the coconut butter and coconut oil together. Keep the temp really low and do not let the mixture get hot, just warm enough to mix together until it becomes a smooth liquid. Put all of the rest of the ingredients except the nuts in the pan and mix together with a spoon. If it taste too much like honey add a pinch more salt to get it just right. Stir in the chopped nuts. Pour mixture into the dish/pan. Let it set up in the refrigerator for about 4 hours. Or for faster set up, put it in the freezer. Cut into 2" x 2" pieces and serve or store in an air tight container in the refrigerator or freezer. This recipe can also be used as a frosting. If you don’t chill it, it will spread nicely at room temperature. To make sure it spreads nicely consider replacing the thick and creamy white Canadian honey with maple syrup or coconut nectar. This fudge becomes soft while out of the refrigerator especially if the temperature is warm. For best results keep the fudge cold before serving.